Boys and girls can enter our Nursery Department in the term of their third birthday on either a part or full time basis. There is an additional intake in the September after their fourth birthday when they can join a Reception Class full-time. Entry into Year 1 or Year 2 is often possible but depends on the availability of places. Children can join the Prep School at any point from Year 3 onwards. Most pupils join the school at the start of the academic year in September but entry at other times may be possible. 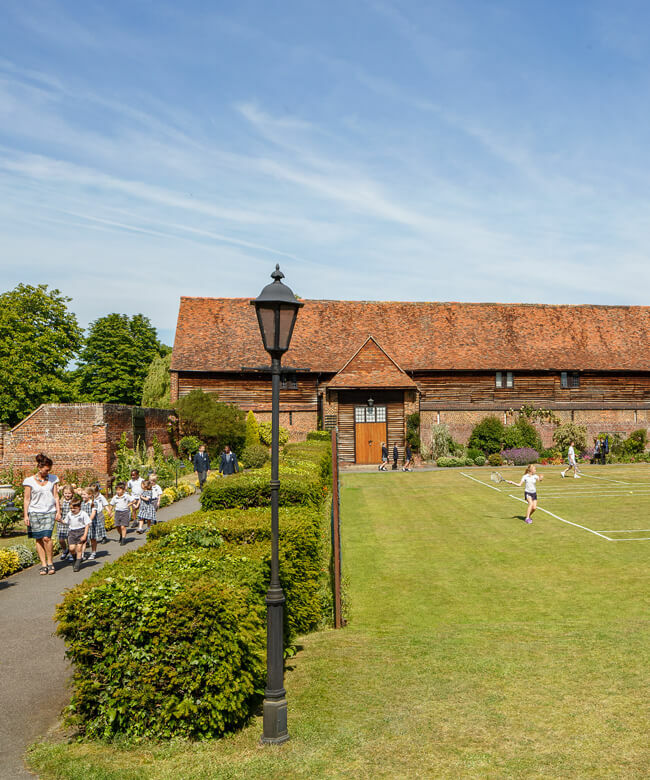 For pupils whose school finishes at Year 6, Junior King’s and The King’s School can offer a ‘through place’ following a good performance in an entrance exam and a positive reference from their current school. This offer encompasses Years 7 & 8 at Junior King’s which is then followed by entry to The King’s School in Year 9. Common Entrance exams are still undertaken but they are intended essentially for setting purposes. Depending on the availability of places, entry into Year 8 at 12+ may also be possible. Please click the panel to the right for our Admissions Process. Parents may register their child at any stage, either before or after their visit. To do so please complete and return the Registration form, together with the registration fee. Your son or daughter’s name is then added to the provisional entry list for the relevant term and year. During the academic year preceding entry, children are invited to visit the school for an informal assessment. This consists of joining a class of their own age group for a day and completing age appropriate assessments of reading, writing and maths. A similar process takes place for these children, who are also expected to take entry tests in English (reading comprehension and writing), maths and non-verbal reasoning. These are generally on a set date in January and entry will be competititve if we are oversubscribed for a particular year group. It may be possible to arrange entry tests on an alternative date later in the year if places are still available. We also like to meet every child during the entry process and prior to making an offer. A school report will also be requested before or after the assessments. Assessment for entry to Year 5 and above will be administered using digital, standardised tests in English, Maths and Non-Verbal Reasoning. Practice papers are therefore not available. Candidates will also be asked to sit a creative writing task. If the assessment has been successful, a formal offer of a place is made. Parents should respond by accepting the place in writing and paying the relevant acceptance deposit. Once the acceptance deposit has been paid and the place confirmed, further information will be sent out in the term preceding entry. Children will also be invited to spend another day or part day in school in order to meet their new class and teachers. Parents should apply for a place as above but should note that entry tests can be arranged at a British Council Centre if easier. The school is able to offer extra English support for those for whom English is not a first language. These lessons are at an additional cost to the school fee.